Dips – A Healthy Pinch. I love me some pesto! Traditionally basil, pine nuts, garlic, parmesan cheese and olive oil are ground by hand with a mortar and pestle but substitute almost much any herb or green (spinach and kale work nicely too), swap out your nuts and oil and you’ve got a unique blend of flavors to compliment pretty much any meal. Oh and feel free to skip the mortar and pestle as using a food processor is much, much faster. I rarely purchase a jar of it because I typically have most of the ingredients readily available in my pantry and refrigerator. 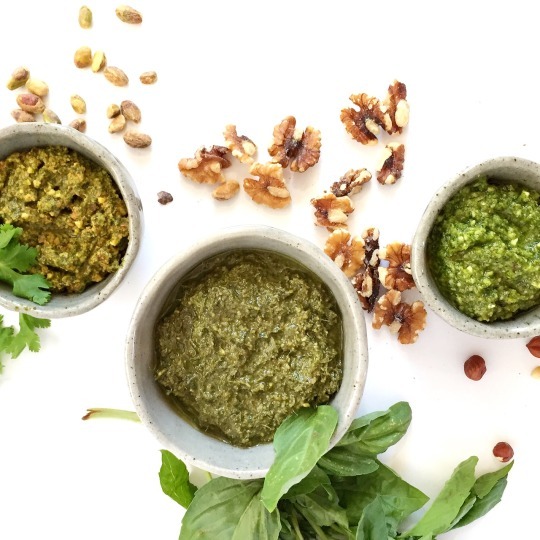 This is why I’ve decided to share three pesto recipes, two of which I use from time to time because it’s such an easy and versatile condiment to make yourself. The carrot-top pesto is a new one for me, but I’ve come to really enjoy its earthiness. There’s nothing traditional about these recipes, though they aren’t ground-breaking; just variations that I’ve used before and wanted to share. Enjoy!